Police have arrested several suspects over the Charlie Hebdo massacre in Paris, which killed 12 people. 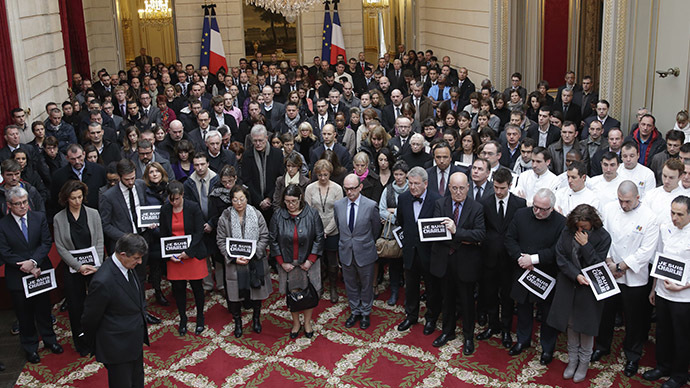 The whole country has begun a day of official mourning for what Francois Hollande called "an act of exceptional barbarism." "Several [suspects] were held overnight," France’s Prime Minister Manuel Valls told RTL radio. Preventing another attack "is our main concern," he added. The names of the detained haven’t been released by the authorities yet. Earlier, they reported that one suspect had surrendered and two gunmen remain on the run after the deadly shooting in the French capital. The three attackers have been identified as Said Kouachi, 34, Cherif Kouachi, 32, and Hamyd Mourad, 18, police said. The names and photos of the Kouachi brothers were later officially released by the authorities. The 18-year-old Mourad reportedly turned himself in at a police station in Charleville Mézières, after seeing his name on the list of shooting suspects shared on social networks. He claimed he was in college at the time the massacre took place in the headquarters of the satirical newspaper Charlie Hebdo in central Paris, reported French iTele. Two other suspects have been tracked down in the Picardy region of northern France, say sources cited by AFP. The men were traveling in a Renault Clio, they were reportedly armed and wearing hoods, Le Parisien reported. The manager of a petrol station near Villers-Cotteret commune "recognized the two men suspected of having participated in the attack against Charlie Hebdo," sources close to the manhunt told AFP. One of the suspects still at large, Chérif Kouachi, was sentenced to three years in prison in 2008, reported Le Monde. He took part in a Paris-based group that recruited candidates to fight with jihadists in Iraq. He was also convicted on terror charges in 2010. Following the Charlie Hebdo attack, a police officer was shot dead and a city employee critically injured in a shooting on the outskirts of Paris. Several Muslim places of worship have been the target of attack since Wednesday night. There was an attack on a kebab shop in the eastern French town of Villefranche on Thursday, and four training grenades were thrown into the courtyard of a mosque in Le Mans. One of the grenades exploded, but no injuries were reported. A gunshot was also reported overnight, with the bullet hitting the mosque. An assailant also opened fire near a Muslim prayer room in the Port-la-Nouvelle district near Narbonne in southern France on Wednesday night. French authorities have introduced the highest state of alert in the country. According to Valls, extra security forces were deployed to secure mosques, synagogues, department stores, shopping centers, train stations and airports. The French PM added that an extra 650 soldiers and 2,000 police officers will patrol the streets of Paris on Thursday. On Thursday, people across the globe to observe a minute’s silence. Crowds gathered in front of Notre Dame in the city center to pay tribute to those killed and injured in the recent massacre.